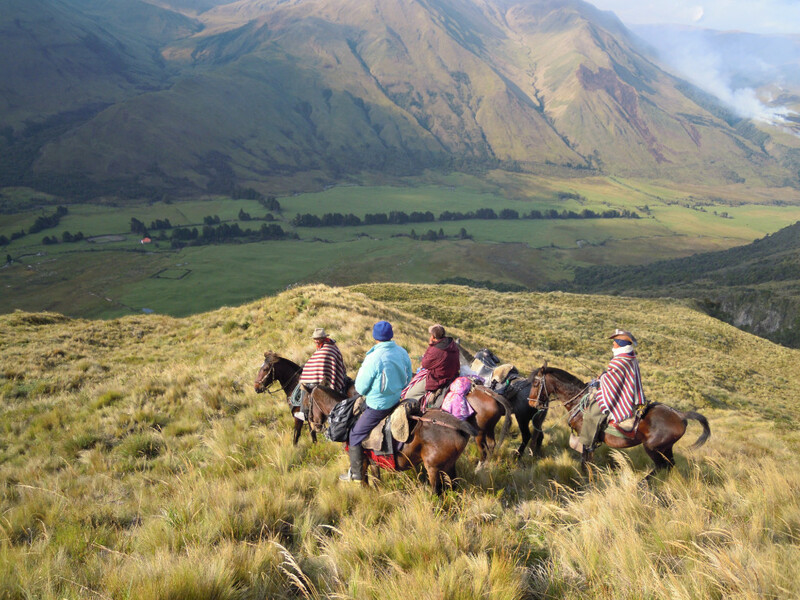 Ecuador’s Critical Geography Collective emerged in 2012 as a result of a happy encounter among geographers, social scientists and activists concerned with answering theoretical and practical questions about growing territorial tensions around the country. Even though Ecuador has had one of the most advanced constitutions in the world since 2008 pertaining to the rights of indigenous peoples and communities1, the government’s promise to put these rights into practice in this post-neoliberal period has not come to fruition. Actualy quite the opposite has been the case. The abuse of collective rights and invasions of indigenous, Afro-Ecuadorian and peasant territories have dramatically increased. In contrast to the previous neoliberal period, the state has become the protagonist in this process while legitimizing a discourse that justifies the arbitrary and violent expansion of its territorial mesh in the name of a supposed national interest and in association with capitalist interests. In constant dialogue with authors who represent Latin American critical geography, our analyses and practices break with the hegemonic perspective which proposes the state as the only agent of territorial regulation: In contrast to this hegemonic perspective, we recognize other social actors as legitimate agents of regulation concerning their own lives as well as reproductive spaces. We denounce the arbitrary violation of rights carried out during the current political period. In fact, our actions are based on the perception that the so-called legitimization of territorial regulation is actually always accompanied by its opposite: the deregulation of organized territories based on different logics and different feelings, in connection with nature as well as human beings. In this matter, geography is understood only as “technical” and – supposedly neutral – knowledge. However, in practice it is tightly bound to a territorial “regulation” that defends the rights of capital interests. The Critical Geography Collective has hereby become a space of formation, research and denouncement, profoundly compromised with resisting the capitalist model of the plundering and degradation of nature and indigenous peoples. Our work is characterized by its collective and dialogic nature, which we try to achieve through permanent discussion and complementarity between our capacities and interests. These are of theoretical, cartographic and communicative nature. They also include other related research. We initiated a series of activities throughout the last four years by associating the use of cartographic tools with theoretical and political reflections in a critical matter. 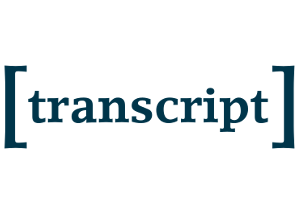 The activities included the following: collective readings and reflection of classic and contemporary writings in critical geography; training on tools for community mapping; research on the background and impact of public policies and laws connected to state territorial regulation; public denunciation of projects connected with capital interests through manifestos and press conferences in order to demystify and problematize the official discourse; organized conversations with national and international guests in order to disseminate other experiences of resistance as well as our own research projects; cartographic simulations of the effects extractivist projects have on invaded territories; finally we tried to generate support, cartographic production and political analyses of the criminalization of protests in Ecuador. thereby create a systemic and critical reading of the tendencies and strategies of capital in their concrete materialization3. This information can then also be articulated within a broader geopolitical context. This allows for reflection about the mode in which capital interests are territorialized in the country. 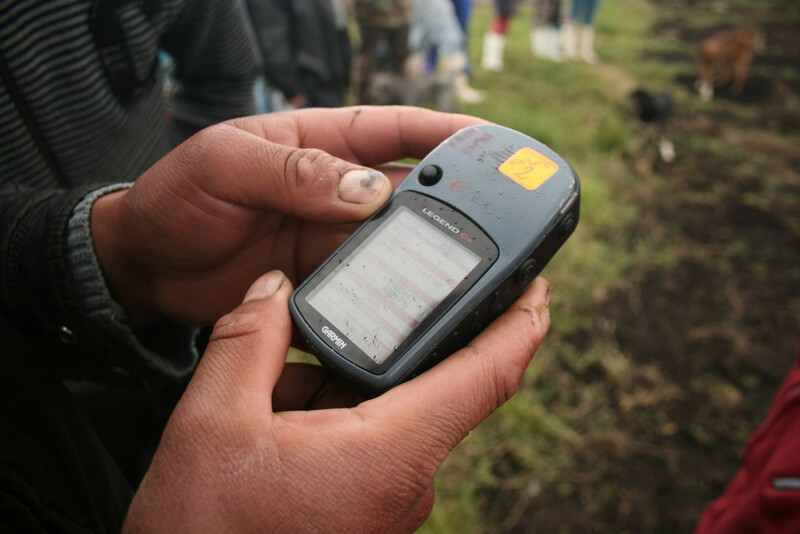 It also generates inputs for resisting communities. Likewise, the construction of the Atlas aims to visualize the latent conflicts generated by the expansion of the territorial mesh of the state. Hereby it shows and explicitly denounces aspects which are generally hidden or mystified by the governmental discourse of local development and national interests. In addition to a few composite maps and explanations about the general context, we have worked specifically on each of the aforementioned cases. The case of oil exploitation in the Yasuní National Park, located in the Ecuadorian Amazon, is perhaps the most emblematic of all. It surely is the most dramatic in terms of the abuse of constitutionally recognized territorial rights in the name of the myth of national development and, in this case, the myth of the Amazonian demographic void4. The map “Record of Incidents with Indigenous Peoples in Isolation in Waorani Territory and the Yasuní National Park” explains the territorial conflicts alive in the zone: One can see the complex superposition of the Intangible Zone Tagaeri-Taromenane (ZITT, indigenous peoples in voluntary isolation), the Waorani territory (recently contacted peoples), the state’s political-administrative division and the protected area of the Yasuní National Park. In fact, more than latent, it is a case of manifested conflicts, in which the killings among indigenous peoples shows the cruelest side of the consequences of territorial pressure and environmental and social unbalances. These unbalances are generated by the expansion of extractivist activities and the resulting infrastructure in and colonization of these territories. As part of the “Cartography to Not Forget”, we presented the map of detentions and militarization of the country apropos the National Strike in August 2015. 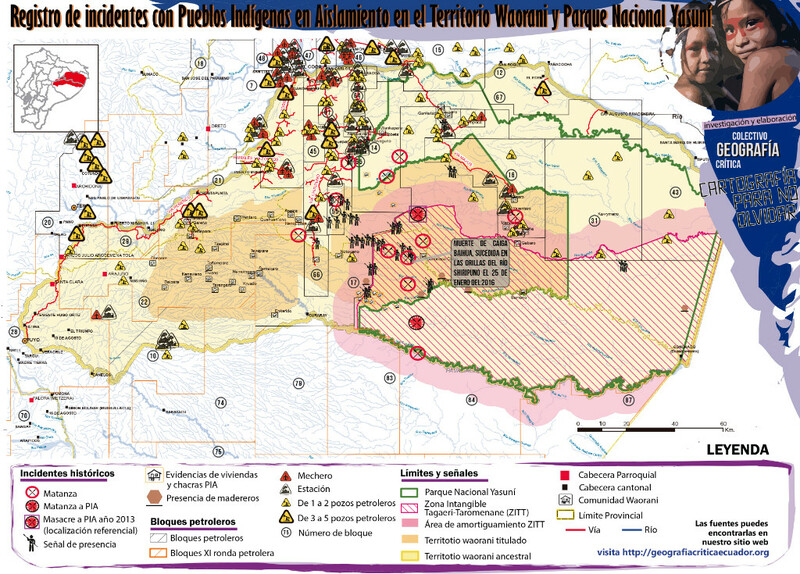 This map shows the repressive strategies of the Ecuadorian state in response to resistance5. Organized by the indigenous movement and rural and urban workers, the strike has been heavily repressed by the Ecuadorian state, through the use of forceful invasion, detentions, aggressions and other violations of human rights. Even though – according to our analysis – direct violence is not the main repressive strategy of the state6, the criminalization of protests has grown brutally in the country throughout the last years. While we respond to specific demands that emerge in the making, we are currently in a phase of reflection about the primary and secondary data generated during the creation of the Atlas. Based on the questions and observations that developed during the first stage, we are currently analyzing some specific themes and challenges: the transversal insertion of the feminist outlook in this analysis, how to guarantee that the material we produce strengthens the communitys social fabric and struggles, and how to characterize the post-neoliberal state in a more precise manner. More than a goal itself, the Atlas has become a means to rethink and strengthen our actions as a collective. It has also become key in building up our capacity to develop a dialogue with and support of resistance struggles. Bonilla, O., Maldonado, P., Silveira, M. & Bayón, M. 2016. Nudos Territoriales Críticos en Ecuador: Dinámicas, Cambios y Límites en la Reconfiguración Territorial del Estado. GeoGraphos. Revista Digital para Estudiantes de Geografía y Ciencias Sociales, 7: 66-103 hdl.handle.net/10045/53465, 22 March 2018. Silveira, M.M., Moreano, M., Romero, N., Murillo, D., Ruales, G. & Torres, N. 2017. Geographies of Sacrifice and Geographies of Hope:Territorial Tensions in the Plurinational Ecuador. 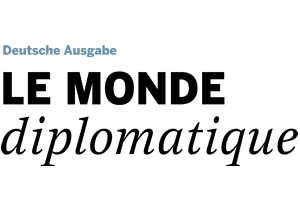 Journal of Latin American Geography, 16(1): 69-92. The Montecristi Constitution recognizes the state as plurinational and intercultural, in addition to presenting an extensive list of collective rights and to considering nature as a subject with rights. The article “Critical territorial knots in Ecuador: dynamics, changes and limits in the territorial reconfiguration of the state” (Bonilla et al., 2016) was the first effort to systematize the Collective’s research. It presents an analysis of the challenges and limits of executing territorial rights in Ecuador. Another article that systematizes part of the research conducted by the Collective is titled “Geographies of sacrifice and geographies of hope: territorial tensions in plurinational Ecuador” (Silveira et al., 2017). 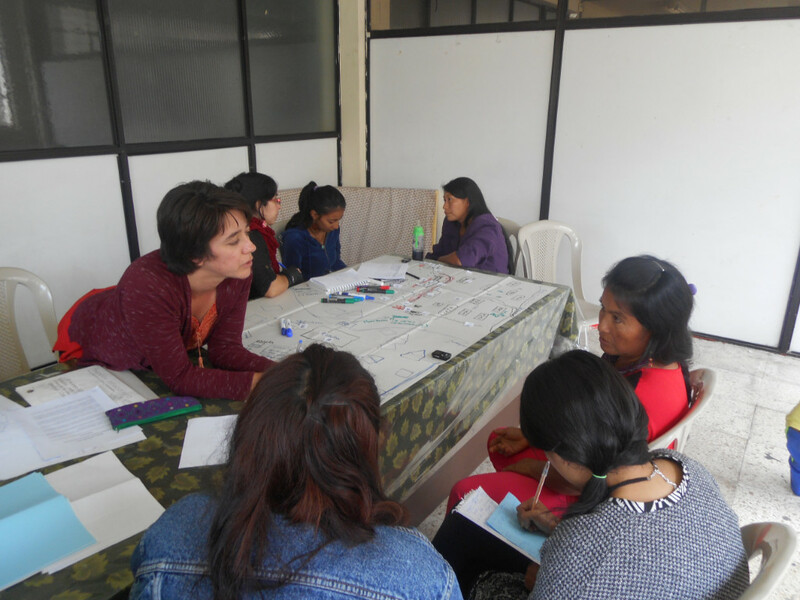 The case selection was based on a the following variables: national relevance, representation, degree of threat to a community, degree of invisibility and relevance, and the linkages and relationships we had developed with some communities and local resistance processes. 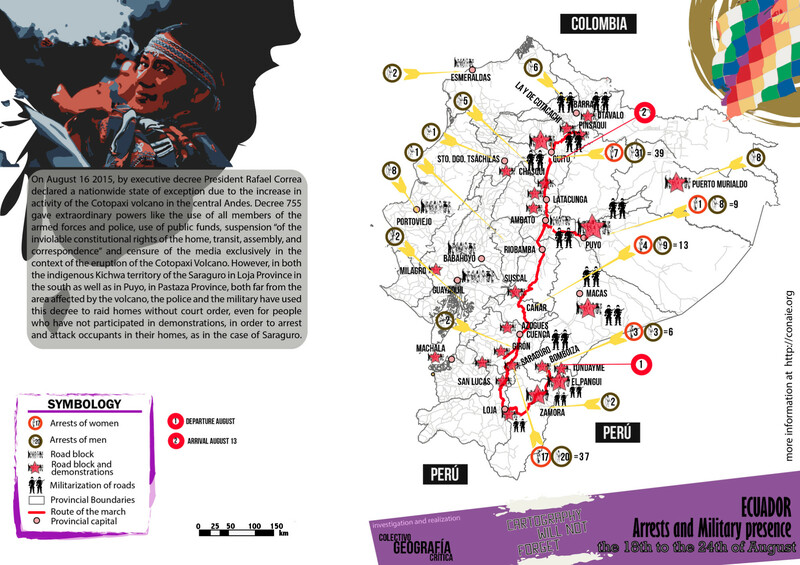 The map is part of the “Preliminary Report about the State’s Strategies of Social Control and Repression in the Context of the National Strike in Ecuador”, prepared by the Psychosocial Research and Action Collective. In the preliminary analysis for the Atlas, we defined three types of repressive action that the state has taken in order to facilitate investments and the territorialization of companies: administrative actions, covert actions and direct violence.The majority of cases are connected with administrative actions.